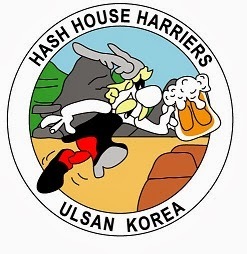 The #432 Ulsan Hash House Harrier Hash shall take place on September 26th leaving the Compound Clubhouse at the winter time of 10:00 Am. So you can drink some more on Saturday night and sleep and hour longer before the healthy run through the Korean countryside. Due to it being a Holiday, the HASH will probably be small in number by high in quality as it will be set by Haggis Muncher. Sustanance shall be provided by Snake and Snake Charmer.